Sidemount diving is a style of equipment configuration which has been gaining tremendous popularity over the past few years. Traditionally, of course, Scuba divers carry their air on their backs. Sidemount (SM) divers carry their gas along the side of their bodies. For comfort and balance it is most common to dive with two cylinders. This ethos originated with cave divers, who encountered problems trying to squeeze through narrow gaps with a back-mounted cylinder. Wearing the tanks under the arms not only reduces the diver’s profile, but makes the tanks more accessible. 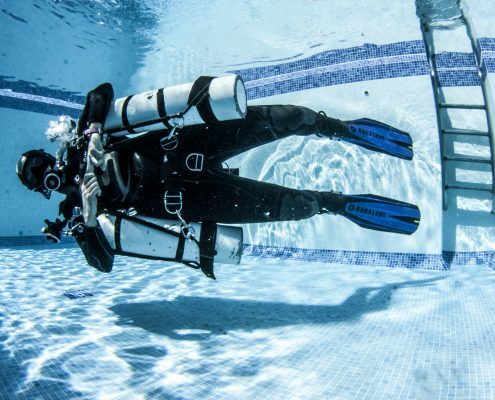 It becomes easy to move the cylinders into any desired position, or even to remove them entirely during a dive. These days, SM diving is hugely popular, even among divers who have no interest in squeezing through tight spaces. SM diving is also particularly popular with those who experience leg, hip, arm or back problems. This is due to the fact that it is possible to don and doff the cylinders whilst in the water. Furthermore, the ability to carry significantly more gas makes this approach popular with divers who finish their air quickly too. If you are at all curious about Technical diving then the Sidemount Course is very complementary. Not only are there many similarities in the equipment configuration, but gas management is a skill which will be developed for both disciplines. Getting comfortable diving with more than one cylinder now will also benefit you later when you transition into Technical diving.